It's looks like the run of esoteric concepts at Illustration Friday has given way to more woody topics - this week, it's "Chair." Chairs can tell plenty about the human condition, designed as they are to fit the human body in a semi-relaxed (not necessarily ergonomic) position, for people pursuing a range of tasks, or just relaxing. Why electric chairs though? I mean, if you're being executed, is comfort considered to be an issue? Bizarre! I digress - there's a certain look I wanted to achieve here - with a fair bit of detail in the linework, but not too much. While working on this, I was reminded of lots of furniture illustrations I did years ago - back in my first marriage - when I was trying to supplement supporting a family on a pathetic salary by going around local printers looking for drawing work. Recently, I've had to knock back a number of paid small drawing jobs due to lack of time - it's frustrating, but a good problem to have, and I'm happy concentrating on my ongoing comics projects (around work and family life). I really like your color choices here - great background and nice line work. I really also like the sense of anticipation that this illustration evokes - you're either waiting for the musician to arrive, or hoping they'll come back soon. Nice job, Ian T. I'm glad for the more concrete - er, woody - theme as well. This is a sweet l'il sketch. Nice illustration. Love your writing as well! This is so nice, Ian! I really like the combination of detailed linework and strong graphic composition. The guitar leaning against the chair is such a great touch! The texture and colors of the background make me think of a brightly painted stucco building in some sunny place...the chair seems to be waiting for someone to sit and strum as people pass by. yeah, what they said! This is a simple, beautiful illustration Ian. I like this. It has an Old World feel to it. I think it's the wall, the ornate carving and the guitar combined. Wonderful! really very neat! 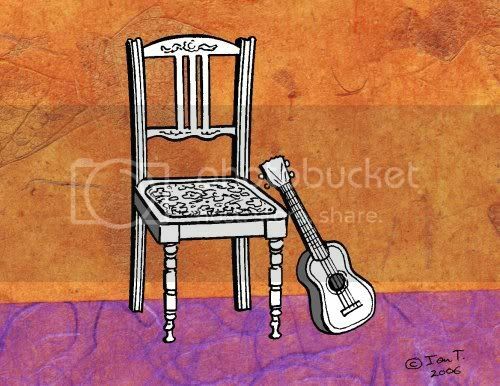 i like the colors you have chosen that has made the black and white drawing of the chair and the musical instrument become more beautiful. it has captured the message of the importance of a chair especially to that person who's going to play the instrument. i love reading your posts, too! I was listening to blind willie johnson as the page opened up so the guitar fitted right in to what i was hearing. Nice textures!